WE HACK 2017! 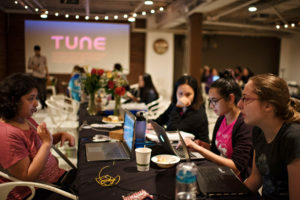 by TUNE, Inc.
Saturday, Aug. 12, 11 a.m. – Sunday, Aug. 13, 2017, 6 p.m.
WE HACK is an overnight, two-day coding event hosted by TUNE at our very own event space, focused on female students (18+) who demonstrate a passion for computer science, UI/UX, HCDE, engineering, and information technology. The purpose of this event is to celebrate the female presence in technological industries, facilitate imaginative and innovative thinking, and raise awareness for challenges that women face at school and in the workplace. Female students (18+) who demonstrate a passion for computer science, UI/UX, HCDE, engineering, and information technology.